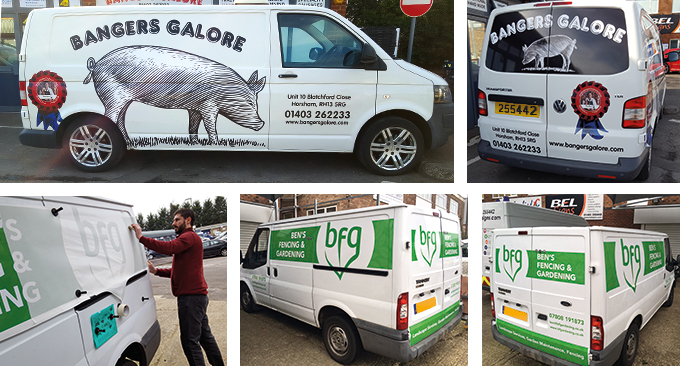 Here at BEL Signs we’re looking at one of our busiest times for vehicle signwriting, as the new styles of van are released eager businesses look to get their logo and details onto them and straight on the road. But how do you go about getting your new van signwritten? And what new models are out this year? And what’s sold the best so far? We have the answers here, so read on. Your van is your advert for your business, so you want to get it noticed and attract possible new business. But where do you start? Once you have approved the cost and our terms your details are passed onto the design and production team. Our in-house team has a catalogue of vehicle outlines, scaled; they allow us to design specifically to your year of vehicle and wheelbase. We can put together visual ideas for all sides of the van and allow for loading doors, ladders, trims etc. Simple ideas include one colour of vinyl with cut shapes usually including logo and text. 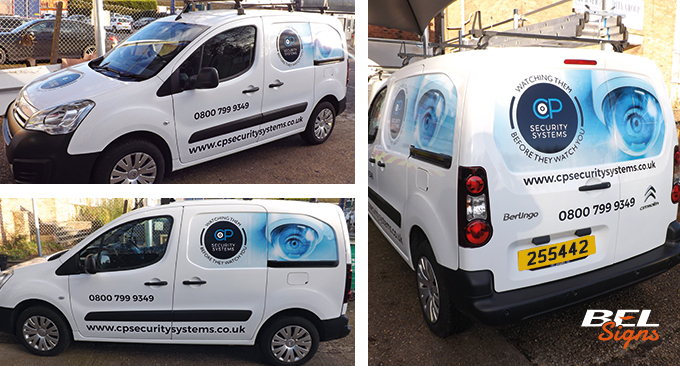 More complex designs include printed graphics wrapped onto sides or within the panels of a van on all sides including the bonnet. We can also offer reflective vinyl, specialist colours, printed colours to match your brand in addition to Chapter 8 kits for highway vehicles. Everything has been checked by you and it’s all good to go, approval is needed in written format so an email will do, it’s then onto booking in. Our production team will then offer some dates to get your van sign written as per design. We will need the vehicle at our factory in Blatchford Road [find us here] for the majority of the day, possibly two if the design is intricate. However, before dropping off the van, check that is clean! The vinyl, wrap or printed graphics need a good clean surface to adhere too, just soap and water will do. 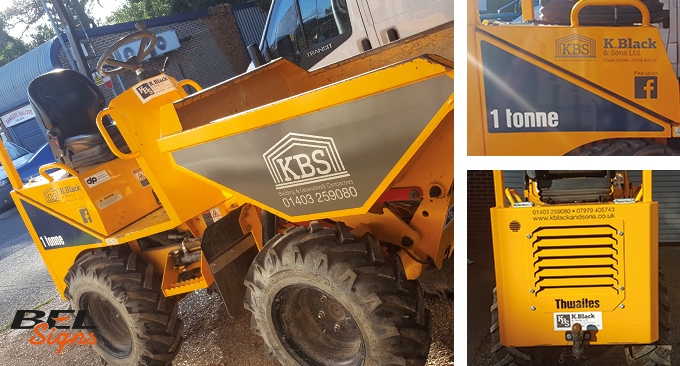 Our team of experts have a wealth of hours and knowledge sign writing vehicles, from cars, 4x4s, all types of van from short to long wheel base, luton vans and also even plant machinery. We ask the vehicle be left with us so we have everything to hand to apply the graphics. We can offer a stripping service if your van already has old graphics that need taking off, just ask about this service. Most areas of a van can be covered, including windows. 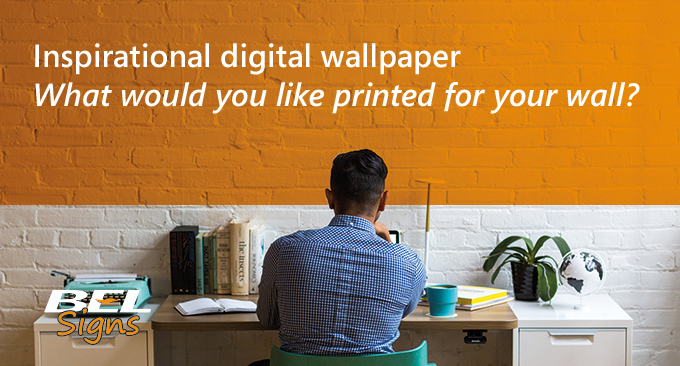 But we know you need to get back to work, so we will call to let you know it’s ready ASAP! Use a mild detergent, clean water and soft brush or a fan spray of water more than 1200mm from livery edges. A maximum 75 bar water pressure and maximum water temperature of 38°C. 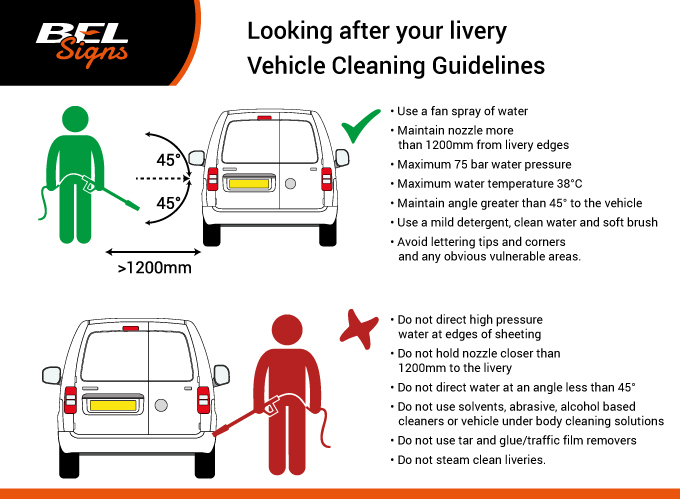 If using a spray maintain angle greater than 45° to the vehicle and whatever you use to clean the van avoid lettering tips and corners and any obvious vulnerable areas. 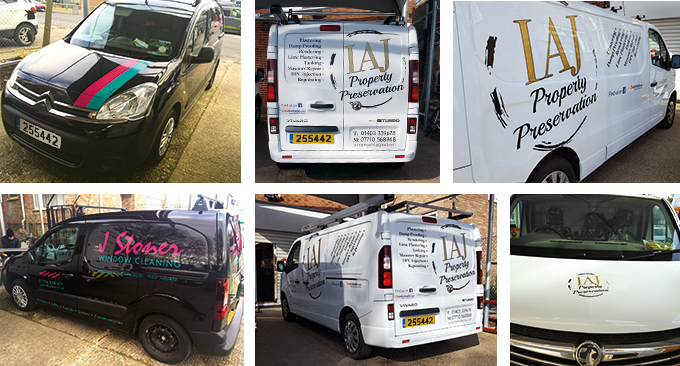 Upload your shiny new sign written van to your social channels and tag us – we’re on Facebook | Instagram | Twitter | LinkedIn and leave us a review on our Google Business Page or Yell, we love seeing our work out and about. So, what vans are out this year? 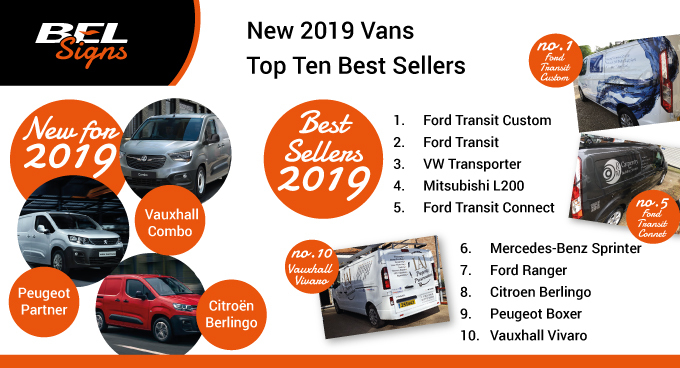 There are a trio of new vans which have all been named joint winners of the International Van of the Year 2019 award; Citroën Berlingo, Peugeot Partner and Vauxhall Combo. There are already 1.5 million Citroën Berlingos, and this is their third generation model out this year. Also voted What Van? Light Commercial Van (LCV) of the year it has some impressive new features including folding front seats for added room or desk space complete with laptop and USB plugs, additional driving aids such as Surround Rear Vision and an Overload Indicator helps you know you’ve gone over the payload. But then the new Peugeot Partner has a fancy ‘iCockpit’ with smaller steering wheel but large 8” digital display with high-set instruments along with a 180-degree parking camera and their own overload alert, along with a payload rating that is nearly the top rate for a small van, able to transport two Euro pallets, it is also one of the best-selling LCV of all time and it too was awarded What Van? LCV of the year. The Vauxhall Combo is off to a good start as it’s pricing is cheaper than last year and can carry more than 1,000kg, claiming to have the greatest payload capacity in its sector, the newer engine is also said to be 16% more fuel-efficient. With 15 storage compartments tucked away, least you can hide your sweets along with your coffee. It’s a tough decision and with 359,086 UK van registrations this year so far, what has been selling the best? And remember once your van is branded, how about your corporate wear, premises or any other signage or printed requirements? We can offer a one-stop shop for all your sign, display and promotion items, we’d be happy to help. 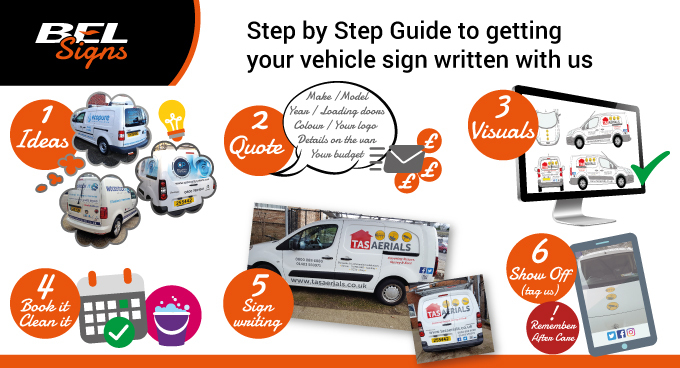 Whatever you decide to buy, follow our simple steps as above and get your van signwritten by the experts. 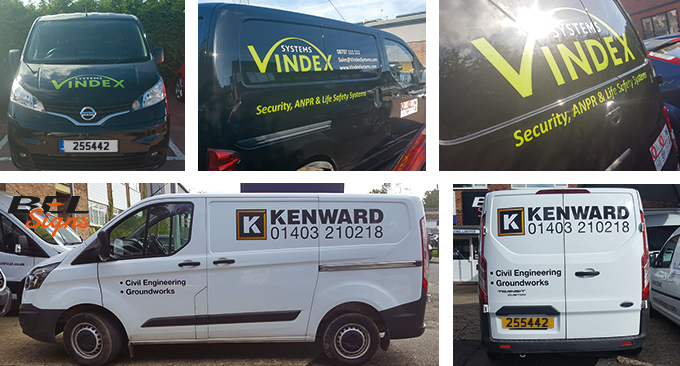 Contact us now to starting getting your 2019 van brand ready: 01403 255442 or email us. Here at BEL Signs some of our favourite signage is that of vehicle graphics. When a small business starts out, a local company grows or we meet a new client through a networking event they will often enquire as to whether they should get their vehicle sign written. The answer is always yes! 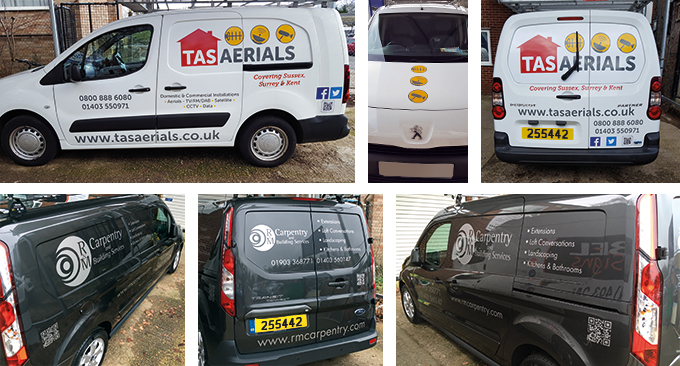 Imagine turning up on-site with your branded van or car knowing everyone would have seen it en-route, it’s cost effective advertising working for you on the driveway or on the job. Sign written vehicle livery provides your customer the confidence that they have booked a professional, trusted and established company. Team it up with printed business cards, quotation sheets, embroidered shirts and jackets – perhaps even printed freebies to leave with the customer to remind them whom to call. We offer all these services in addition to signage, banners, site boards all bespoke and suited to your needs. Here’s a round up of our latest projects covering van graphics, car sign writing and also plant machinery… as anything with wheels can be covered, including an interesting project for HDC Year of Culture, but more about that in the new year! Two colour CAD cut graphics including logo and contact details onto a brand new NV200 with double sided loading doors and rear doors with panels. Accreditations and awards were printed as a collection and fitted neatly as a group. Kenward logo has a subtle gradient of orange colour within it – meaning this has to be printed. This printed logo is then fitted together with text onto three sides. Not much in way of creative details, but when on-site you obviously know who is in charge. 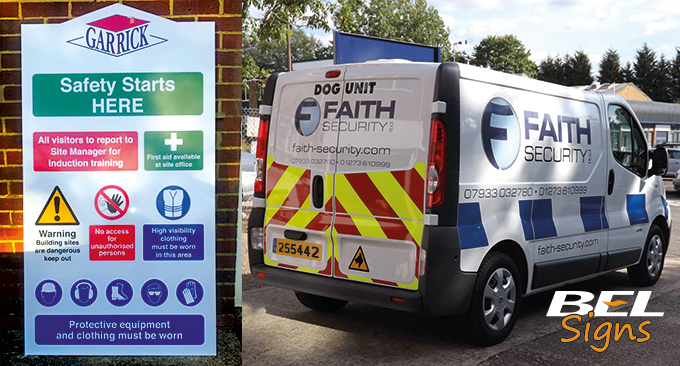 Large digitally printed graphics onto the panel sides and rear doors incorporating CCTV image and their logo. Another simple but effective two colour CAD cut graphics in a light grey and light blue logo and service list with water drop elements within a tight budget. 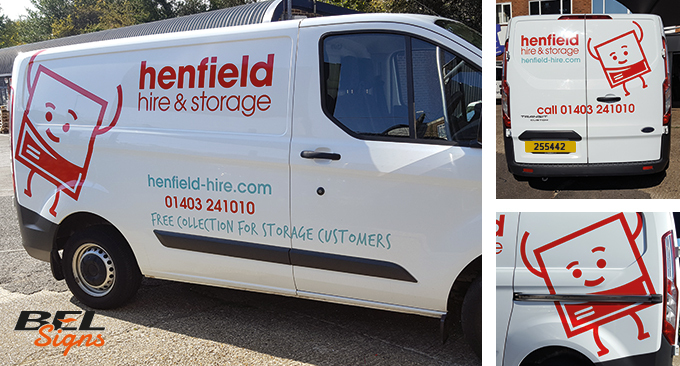 This fleet of vans has two specific colours of vinyl to match Henfield Hire’s brand guidelines including a large graphic element on three sides. Smart looking printed graphics to fit onto odd shapes on a Takeuchi digger, with logo and details on all sides. Any type of vehicle can be sign written with your business details. 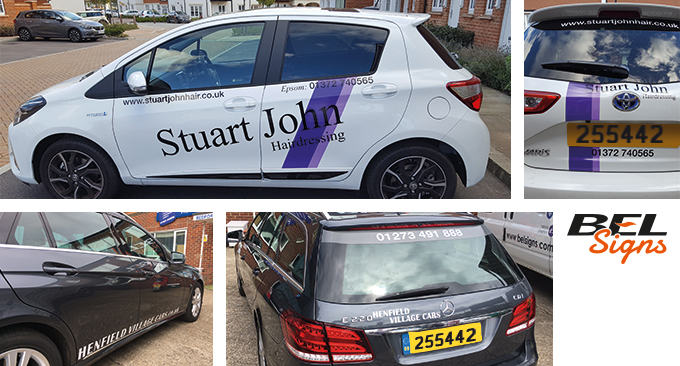 This 5 door hatch for Stuart John Hairdressing has printed vinyl stripes in purple on all sides. The bonnet stripes are angled with the contours and the details fit onto the rear door. A regular supplier of graphics to this local taxi firm, white CAD cut graphics were applied to this grey Mercedes E220 Estate, simple and effective. We also offer a design service, with an extensive outline catalogue we are able to adjust designs to fit around the type of van you have. Whether short, medium or long base, small light commercial to large high tops in any colour or year. We can then advise on graphic placement and design to suit your budget. Contact us now to make your business vehicle stand out from the crowd and advertise your business while out on the road or on-site. 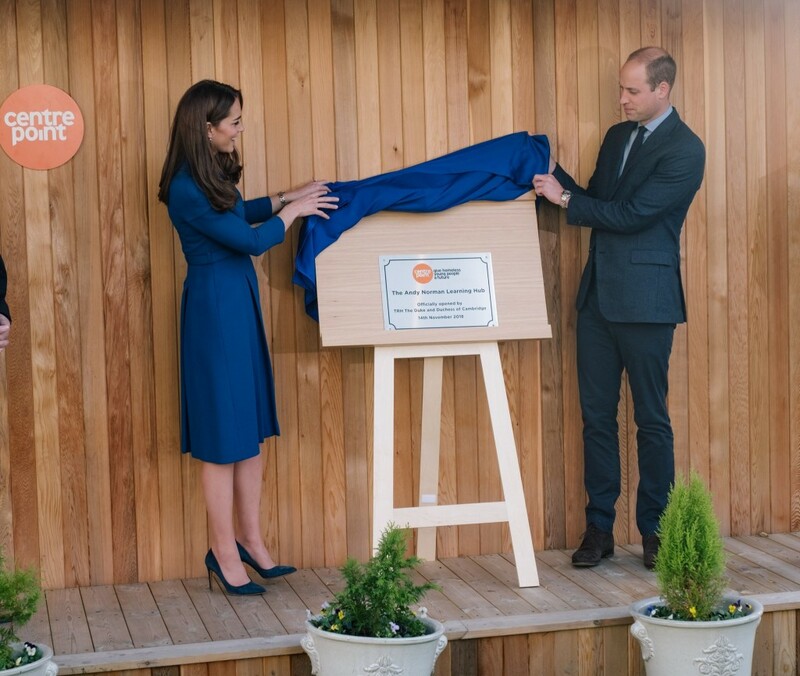 It’s not every day that you find your services are required for the Royals, so we are very proud to be involved with a project that saw our supplied plaques unveiled by TRH Duke and Duchess of Cambridge! Centrepoint help young people with housing support in the UK and also provide learning facilities and courses to young homeless people to help their future. 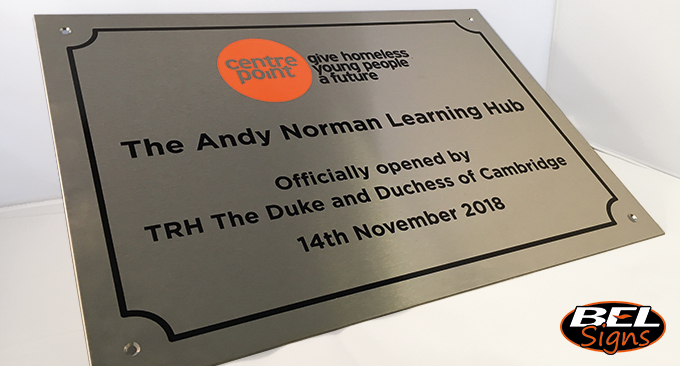 Commemorating the opening of a new learning hub in Barnsley, Centrepoint required an A3 plaque for the exterior and an A4 plaque for the interior. 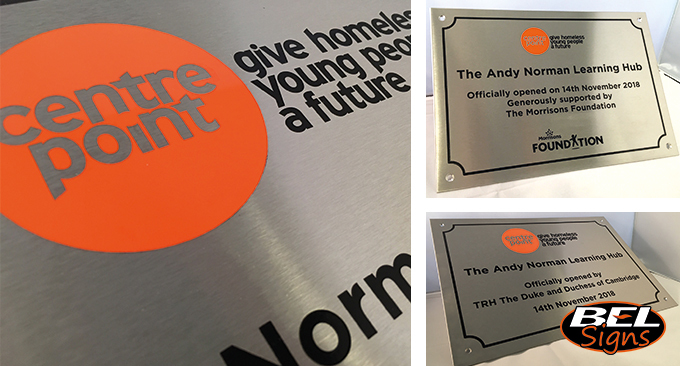 Both plaques, in a brushed stainless steel, required the Centrepoint logo to be filled with corporate colours, a bright orange and black, four holes drilled for fixing and supplied with screw caps for a smart finish. Obviously early on we knew the plaques were something special as our client, Centrepoint, provided us with the wording for the proofing featuring the names of royalty. It was only this month that the plaques were unveiled and the Andy Norman Learning Hub officially opened. You can see photos of the full event here on Centrepoint’s Facebook page. So why chose a stainless steel plaque rather than a brass one? Stainless steel offers a great finish, a grey silver effect rather than that of bronze or brass, it is a modern look, which is much easier to upkeep as it requires less polishing and will not tarnish so quickly. Able to stand up to weathering and harsh elements, it is ideal for external use. It can also compliment colours filled within it and it’s surroundings as it is a much more subtle colour than that of brass. These plaques feature an easy to read font filling the space of the plaque, along with a border for an artistic flourish. We can also offer backing boards and plaques are manufactured and bespoke to your needs. If you require a commemorative plaque for your building or event, contact us for a quotation or a site visit, we are happy to help. 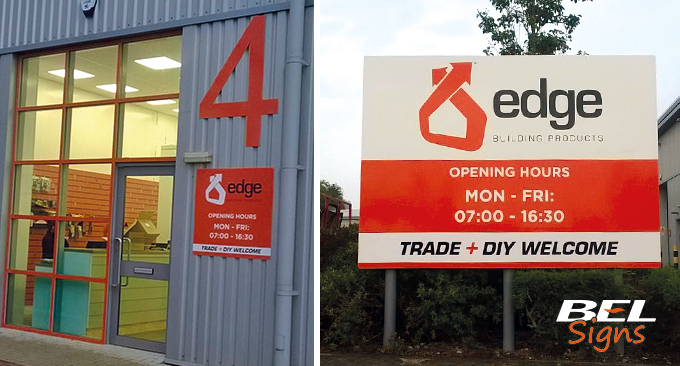 Just round the corner from where we’re based is Edge Building Products, a trade counter for all things PVCu, they rebranded some time ago and now have an orange arrow logo with house symbol and sleek black typography. Moving into the same industrial estate in 2010 they came to us for signage for what was then their new unit. 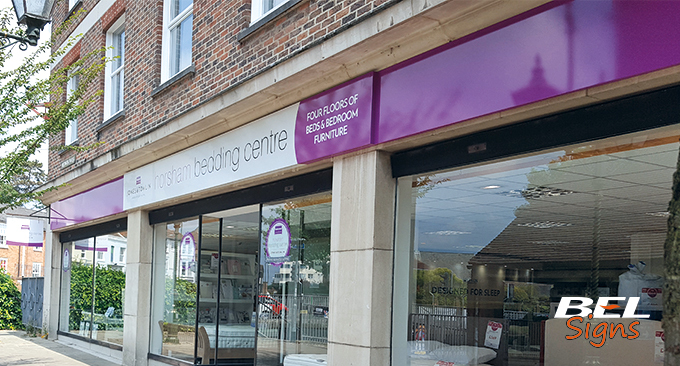 Now eight years on their growing business has three branches, Horsham, Fontwell and the newest addition Croydon. 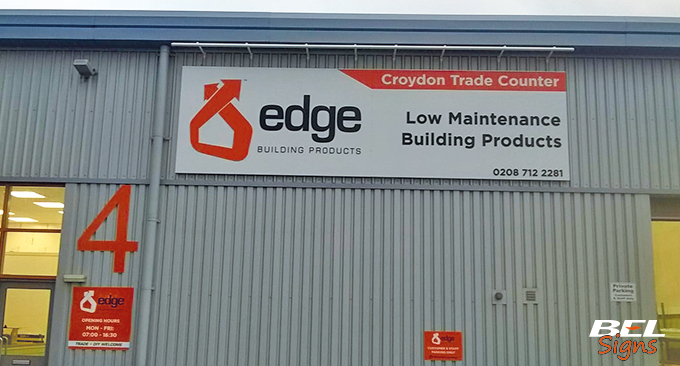 Happy with the previous service, we were asked to manufacture and install the signage at the new South London branch. Main Fascia – A large external sign that comprised of a box folded ACM (Aluminium Composite Material) tray nearly seven metres in length and made of two parts. Graphics on the sign were flat cut ACM and faced in black and orange vinyl to match corporate colours, this meant the lettering and logo were slightly raised from the background. Completed with white finish LED lighting on steel brackets. An Entrance Sign – This sign needed to be wall mounted next to the door and under the existing unit number. Again this signage was covered in the corporate orange and black. Made again of external grade ACM, we used CAD cut vinyl graphics and installed the signage with screwcaps for a flawless finish. Smaller parking signs were created using the same technique as the entrance signage, however these were fixed with rails due to the external cladding of the building, again all in Edge Building Product branding and with radius corners giving a neat effect. More of these were made and fixed onto posts within the car park itself. 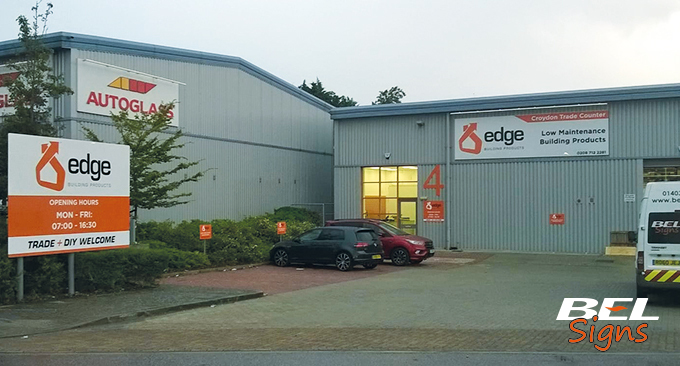 We also covered the large unit number of the premises and the door sections in the corporate orange vinyl, so everything about the exterior of the the trade counter looks consistent and professional. Lastly a roadside sign was manufactured and installed on the corner of the premises, like that of the parking signs, this was much larger with radius corners and vinyl cut graphics, fitted onto three grey posts. As always our expert team arranged a site visit to survey the premises ensuring accurate measurements were taken, surveying where signs need to be installed in particular groundwork for fitting posts and that materials and fixtures were suitable for the positioning of the various signs. 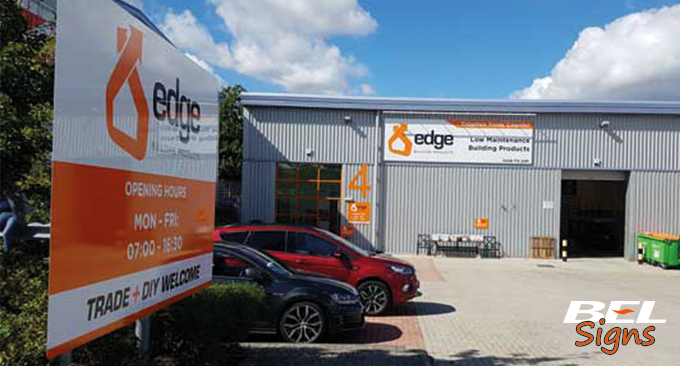 We look forward to working with Edge Building Products again in the future, especially with the success of this new branch. BEL Signs understand fleet managers need to deliver cost-effective and agreeable solutions that also ensure branding is consistent across vehicles. 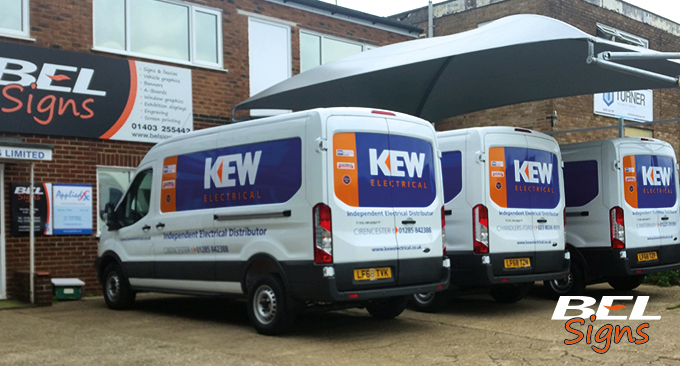 So we’d love to show you our work for Kew Electrical. Their branding consists of two bold colours that are CAD cut and fitted onto all aspects of the van, this includes bonnet logo, rear doors, colours covering the side panels in addition to industry award-winning logos which are printed and applied. 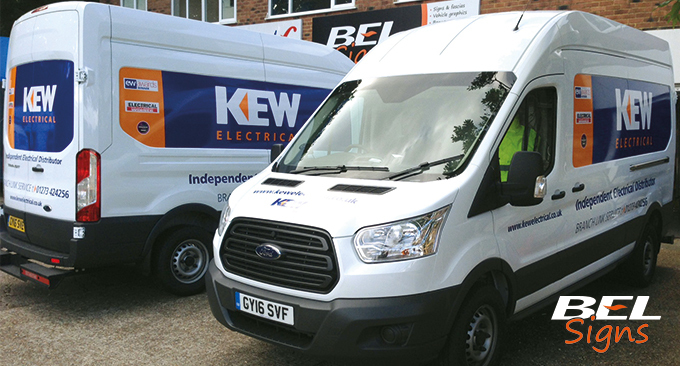 From Bath to Maidstone, Guildford to Dover we have been ensuring each branch of Kew Electrical van has excellent graphics since 2014. Each vehicle has branch details tailored for each van. These vans range from long body lengths L3H2 and L2H2 Ford Transits to short wheel based Ford vans. With 24 branches across the UK, this Independent Electrical Wholesaler looks to be ever growing and succeeding, with van livery that boosts their corporate image and stands them out from the crowd we are pleased to be helping them get that message across on the road. Contact us today to arrange a consultation, quotation or site visit. 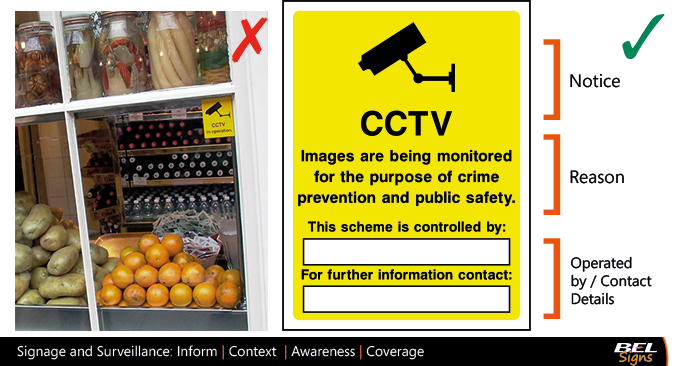 With the new General Data Protection Regulations (GDPR) where CCTV is in operation, you must display signage that advises people of recordings. Signage must be visible and as such can also be viewed as a deterrent. So how can signage help you comply? Signage must be clear, informative and with contact details. 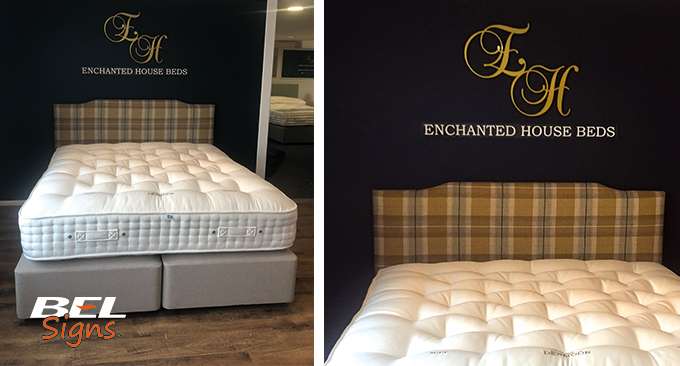 Here at BEL Signs, we offer a bespoke service, where signage can be branded with your logo and additional company details all exacting to your requirements. 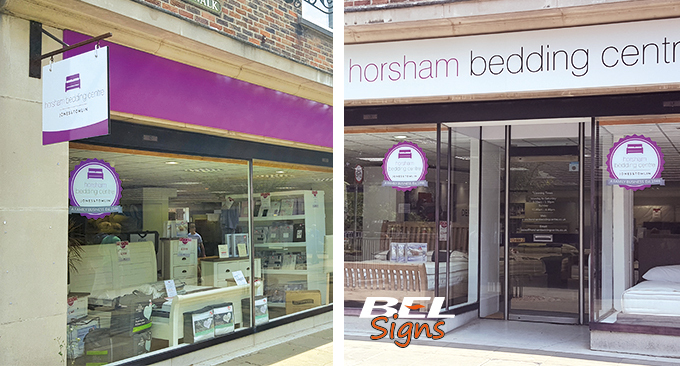 Signage can also be made to suit your space, whether external or internal, on a variety of materials. Surveillance signs can be fitted onto existing walls or posts. However, we can also provide an installation service placing site-specific posts for signage or fixtures. Arranging a site visit with our signage experts can help with the hassle and any confusion, offering our expertise. Do you have a justification to be monitoring a space or people? In addition to a reason for storing the data and monitoring it. You must have grounds for doing both and be using the recordings for intended purposes. Be sure to set-up your contact with all the relevant information, perhaps a dedicated email address. Ensure all staff are made aware of GDPR regulations and then who and how people can make contact with the operator, should they wish too as individuals have the right to request a copy of the footage, as do the police. These details can be printed on signage, or we can put together a design with everything listed in a clean format. Remember it’s not just the public that needs to made aware but your staff too may be monitored by CCTV so they too should be informed. Signage for these can differ in tone and look, but should always conform. What Health & Safety Signage do I need? Health and Safety Regulations requires employers to ensure signage is not only provided but also maintained where there is risk. Obviously signage is designed to warn and instruct but with so many types of signage covering all types of workplace along with a variety of legislation, health and safety signage can seem overwhelming. 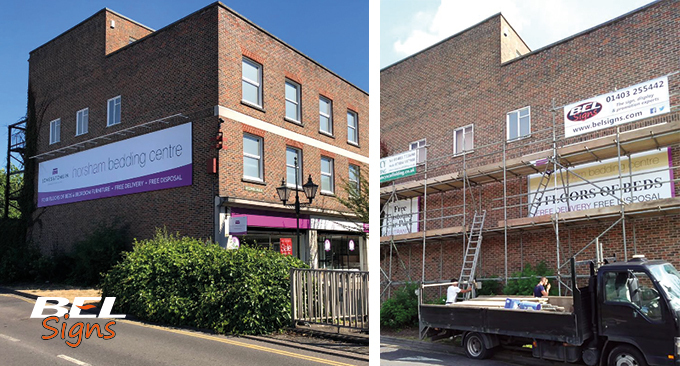 Here at BEL Signs we have over 40 years experience in signage, not only can we advise on which type of signage you would need, but also offer a site visit with consultation to help your business comply. Size of signage can depend on location and position. We also offer specialist signage such as tactile signs for the visually impaired. Health and Safety signage needs to be considered for issues in any workplace, including healthcare, schools, construction, agriculture and hospitality industry, for placement in offices, restaurants and events. Being clear, using recognised symbols that are easily understood in the right colour and shape. 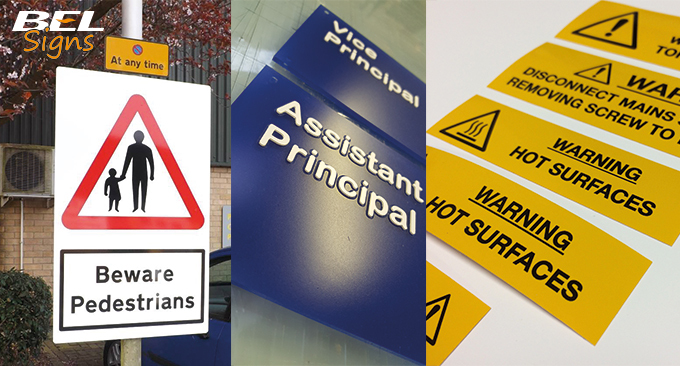 BEL Signs manufacture a huge range of standard and bespoke signs that can be supplied or installed on site. 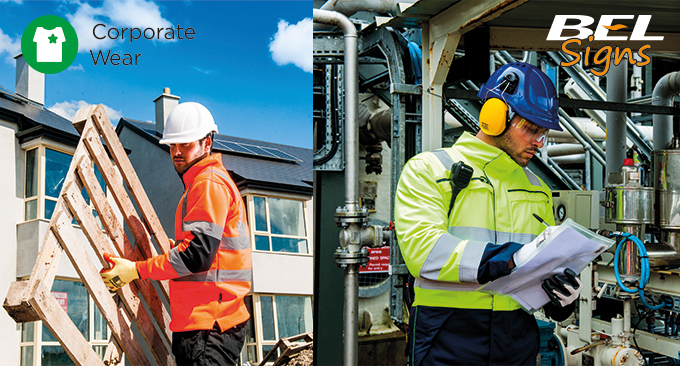 Working outdoors or with potential hazards you may also need high visibility clothing and work wear. 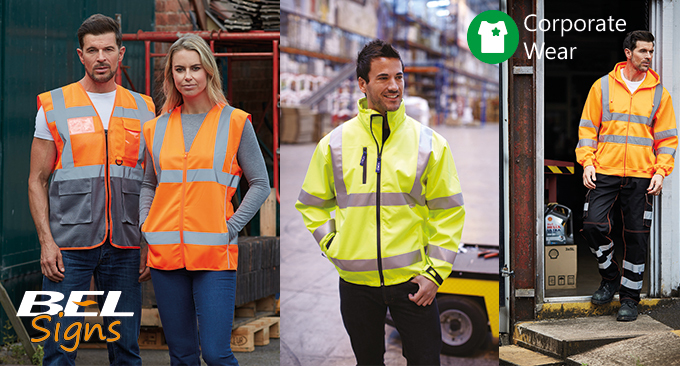 Our sister company Appliedfx offers a large range of Hi-vis clothing conforming to industry standards and which can improve worker visibility during the day, in low-light conditions, and at night. Items such as jackets, fleeces, waistcoats, tabards, polos and overtrousers in fluorescent yellow-green, fluorescent orange-red and fluorescent red with reflective bands. We specialise in adding your logo or branding with embroidery, badges or as a transfer and we can also personalised items with names. In addition we also offer a signwriting service to fit Chapter 8 kits onto vehicles working on highways. These can cover the rear, side, tailgate and doors on vans, cars and trucks. BEL Signs can be your one-stop shop for all your Health & Safety needs. Our bespoke signage service allows us to make signs tailor made to your requirements. Contact us for a quotation, consultation or site visit now to make sure your business is complying. Think about the amount of time you spend behind the wheel driving your van or business vehicle. Now add in the time the vehicle is on a driveway or perhaps parked on the road. If it is just a plain van you have missed an opportunity for free advertising. Large businesses fully wrap their delivery vehicles in graphics, to remind customers of their brand, but also to evoke a feeling or prompt a purchase. Your vehicle could be doing the same. 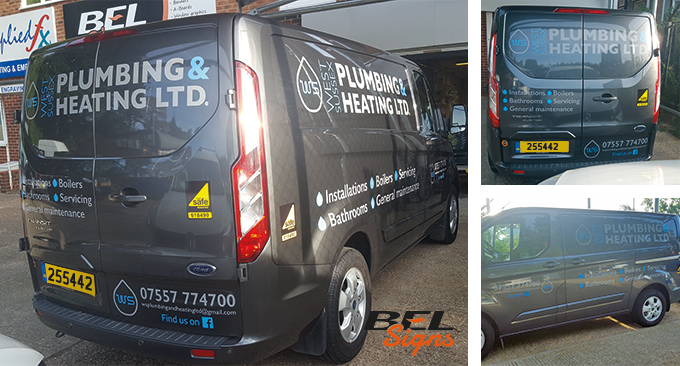 Here at BEL Signs our team has the specialist knowledge to design, cut and print and then install your unique graphics onto your van. Three colours of vinyl overlapped for logo and icons on all sides including wrapped panels on rear doors. Silver Grey vinyl details and logo with QR Code on sides. Large logo graphic in black and gold with brush stroke effect additional bullet-pointed services list on the panels. Logo on bonnet. Colour logos for Check-a-Trade and social media. Black van with two bright colours; cyan and pink to match logo design. Stripes on the bonnet and details on all sides with call to action on the doors in the same font. 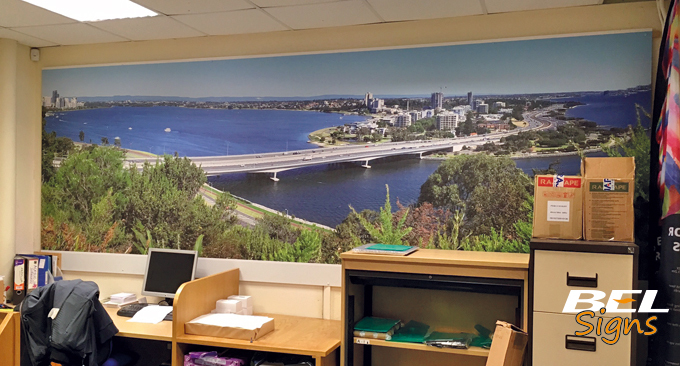 Large format printed pig graphic cut and applied to both sides. Logo and pig graphic on rear glass. Printed colour rosette on all sides. Black vinyl details on all sides. Printed graphic has a subtle leaf design on the background which was then wrapped onto the side panels and back with large green vinyl cut logo. Green strip on rear doors with services listed. BEL Signs also offer a design service, with an extensive outline catalogue we are able to adjust designs to fit around the type of van you have, whether short, medium or long base, small light commercial to large high top in any colour or year. We can then advise on graphic placement and design to suit your budget. We can offer a wide range of coloured vinyl’s, reflective, Chapter 8 kits, large format prints – if you would like a large photo partially wrapped on a large section of the van, let us know if you would like some ideas, just contact us for a quote.